This Pumpkin Spice Coffee Frappuccino Recipe provides a sweet and delicious autumn treat. If Fall is not quite the weather you expect, especially for us here in Florida, but you still want an Fall taste, this treat will keep you cool but still satisfy your pallet. There is no need to spend $5 or more on a yummy coffee drink when you can make it at home yourself for a fraction of the cost! Don’t get me wrong I completely understand the call of the enchanting green siren, and do on occasion give in. But going in with the kids also means 2 cake pops and 2 organic milks, and don’t forget your drink! It becomes hard to make it out of the store for less than $15! When not indulging your self and saving the cash in your wallet, It’s nice to have an alternative recipe for home. Frugal Tip: Anytime you have leftover coffee (ya me neither, but just in case you do) freeze it in ice cube trays to use for yummy iced coffee drinks. Blend all ingredients in a blender until completely smooth, pour into glass. Top with whipped cream, a dash of pumpkin pie spice, and if you really want to be decadent, drizzle some caramel and sprinkle with candy sugar. 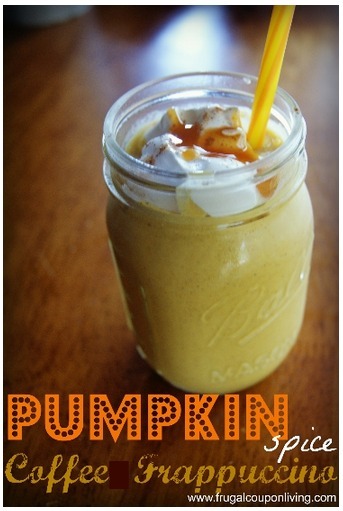 Like the Pumpkin Spice Coffee Frappuccino Recipe? Be sure to Pin to Pinterest and to find more Pinterest Ideas and Recipe Ideas on Frugal Coupon Living. 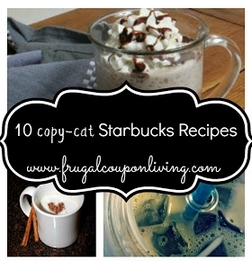 Don’t forget the Starbucks Copy-Cat Recipes! That looks AMAZING! Sharing on twitter. Thanks for linking it up at Monday Funday!